Apple, as we know, is known well for its success in the market. However, the Silicon Valley company claims that the Apple Watch sales have gone down, way down. In order to track the sales, Slice Intelligence used e-receipts from 2.5 million shoppers in the US and has tweeted a graph which estimated the number of the sales. From the diagram below, it is evident that the sales are going down with no signs of increase. 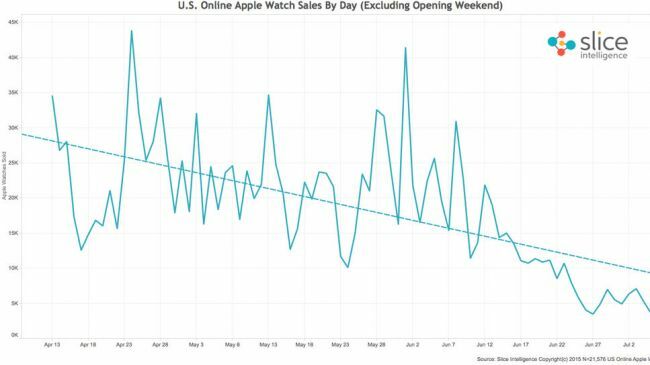 Initially, when the Apple watch was released, it received around 30,000 to 35,000 orders per day but recently, the number has plummeted to under a 5,000 units per day. Last May, Apple’s senior vice president of operations, Jeff Williams stated that the Apple Watch was selling a lot but not enough (as expected). Although the recent sales reports come from Slice Intelligence, Apple is yet to comment on the sales of the Apple Watch. How can we justify the figures of Slice Intelligence to be somewhat accurate? According to them, the data correlates with that of the US Department of Commerce’s and Amazon’s salesfigure by more than 96 percent. Apple might be releasing the sales figures for the Watch when it will release the Q3 results. However, there’s always the possibility of increasing the sales number!